da Vinci Surgical System is the most progressive robotic laparoscopic technology available anywhere in the world today for urologic, gynecologic, and certain other surgical procedures. With this technology, even major surgeries can be performed through the smallest of incisions. The surgeon operates while seated comfortably at a console viewing a 3D image of the surgical field. The surgeon’s fingers grasp the master controls below the display, with hands and wrists naturally positioned relative to his or her eyes. The system seamlessly translates the surgeon’s hand, wrist and finger movements into precise, real-time movements of surgical instruments inside the patient. The 3D magnification provides surgeons greater than twice the viewing resolution and 20% more viewing area. This means improved clarity and detail of tissue and anatomy — critical when performing delicate dissection or in reconstructive procedures. 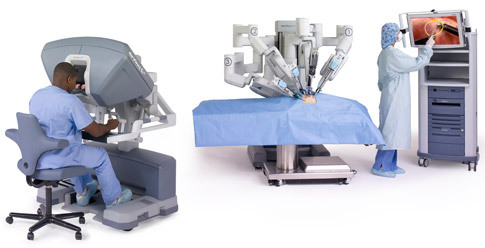 Many surgical procedures performed today using standard laparoscopic technique may be performed more quickly and easily using the da Vinci Surgical System. This is because the da Vinci Surgical System delivers increased clinical capability while maintaining the same “look and feel” of open surgery. Most importantly, patients may experience the following benefits: reduced trauma to the body, reduced blood loss and need for transfusions, less post-operative pain and discomfort, less risk of infection, shorter hospital stay, faster recovery and return to normal daily activities, and less scarring.